In Part Two, we’ll have a look at the arches and bridges from the Reservoir on north. Most arches are concentrated in the southwest and southeast stretches of the park, mainly because those were the most populated parts of the city in the 1850s and 1860s when the Park was being laid out and those were the first parts of the Park to be developed and landscaped. 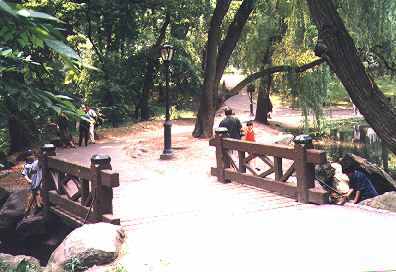 No less care, however, was devoted to Central Park’s northern stretches by the builders, Olmsted and Vaux, and north of the Reservoir there are many treasures to be found, including some ‘you’d never believe you’re in NYC’ moments. So named because it sits on the southwest edge of the Reservoir, this cast iron bridge was taken apart and reconstructed in 1979 according to Vaux’ original specifications. The triangular space at each side of an arch is known as a spandrel. 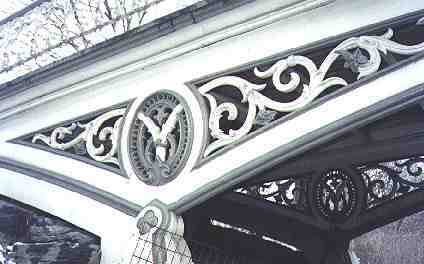 SW Reservoir Bridge’s spandrels boast intricate floral motifs. Location: takes park path over bridle path just west of 5th Avenue near The Reservoir at approximately 86th Street.Built: 1865 by Vaux and the Cornell Ironworks. 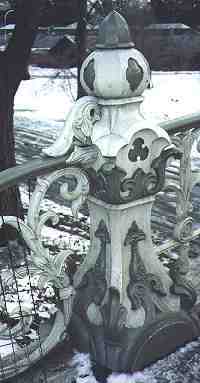 Made of cast iron and steel. 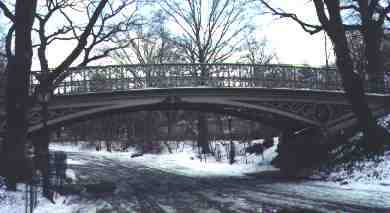 Unlike other cast iron bridges in Central Park, SE Reservoir Bridge is distinguished by a flat platform instead of an arched one (or not distinguished…). Like its sister, SW Reservoir Bridge, this bridge has also been reconstructed. In 1989 its concrete deck was replaced with a tongue and groove wood deck, and it got new railings to approximate the original ones from 1865. Leaving SE Reservoir Bridge, continue on the bridle path around The Reservoir. 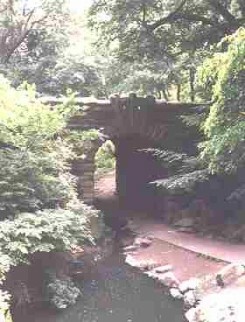 As we get to the northern end of Central Park, arches and bridges become fewer in number. Still, we have yet to see some of the more beautiful arches the Park has to offer, as well as some out-of-the-way, almost rural, locations. Location: takes park path over bridle path north of The Reservoir, south of the tennis courts and South Meadow at approximately 94th Street. Built: 1864 by Vaux and the Cornell Ironworks. Made of cast iron and steel. 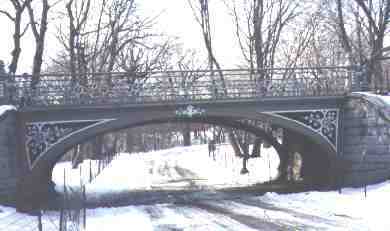 Gothic Bridge is the third of the great Central Park cast iron bridges around the Reservoir. 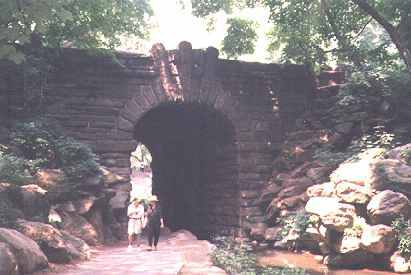 In the first decades of the Park, before auto traffic, there was a great deal more recreational equestrian traffic in the park, and so the builders endowed the bridle paths with quite a number of arches and bridges that would enable pedestrians to pass over them. 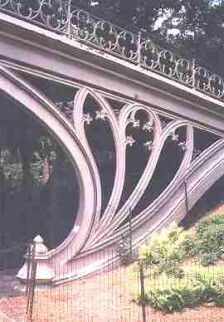 The triangular spaces at each end of Gothic Bridge (called spandrels) were given curved ironwork suggestive of Gothic church architecture of the Middle Ages, hence the bridge’s name. 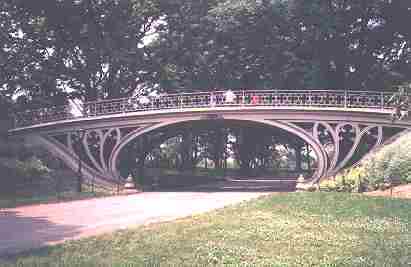 The graceful curves and oval vault make Gothic one of the most distinctive bridges in the park and one of the first that photo editors turn to when they require an evocative Central Park scene. Location: takes service road at 90th Street over park path at Central Park West. Built: 1890; designer unknown. 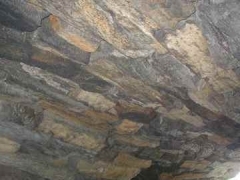 Made of Manhattan schist. One of the hardest Arches in Central Park to spot,especially in spring and summer, Claremont Arch is relatively new, having been built almost 30 years after the opening of the Park. 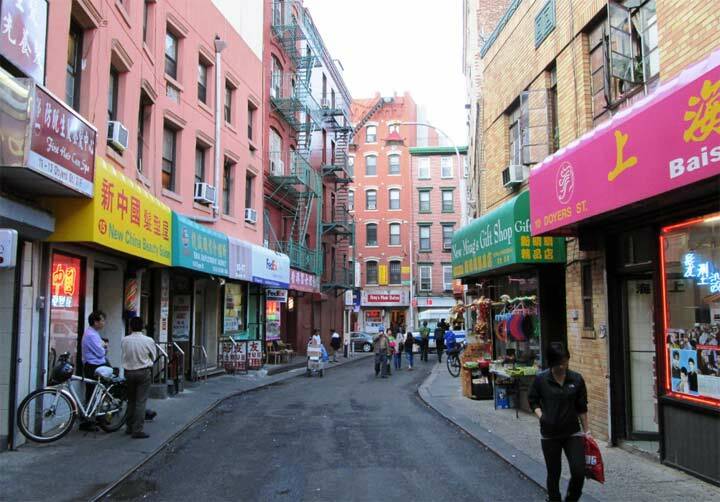 This part of Manhattan was not built up until the 1880s. It is named for the now-closed Claremont Riding Academy on West 89th Street. 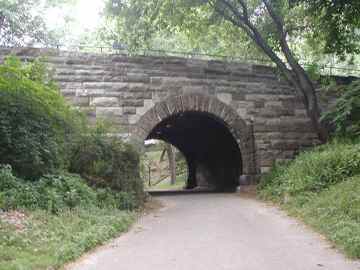 Equestrians often ride on top of this arch in order to access the bridle path, which runs along West Drive here. 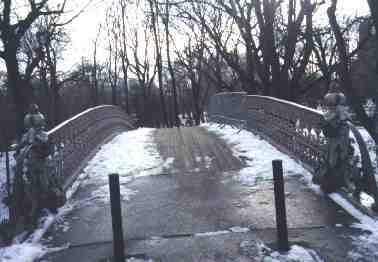 As of mid-2001 the pedestrian path under the arch was inaccessible. Location: takes park path under West Drive, east of The Pool and west of The Loch, at about 102nd Street. Built: 1865 by Vaux. Made of gneiss and ashlar. Glen Span is the bridge to another world, a better one perhaps? 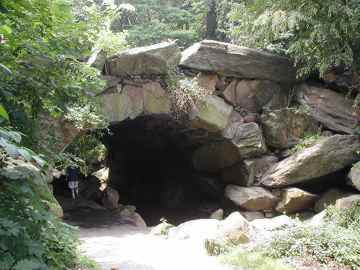 Through this portal lies the Ravine and The Loch, the most secluded area of Central Park. Here the traffic noise falls away and the only sounds are the splash of the stream known as Montayne’s Rivulet, which runs from the Pool to Harlem Meer to the northeast, the chirping birds and the bullfrogs. Once again, keep in mind that it’s an entirely artificial construct…the Pool and Harlem Meer spring from the genius of Olmsted and Vaux. Before moving on to our next arch let’s linger here awhile and check out some of the smaller bridges that were designed for this isolated area. This very short wood bridge crosses the rivulet just west of Glen Span and just east of The Pool. 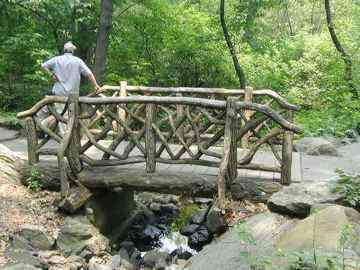 Unlike other Central Park wood bridges, it doesn’t feature contorted, distressed branches: instead, it has been ingeniously fashioned from old wooden parkway lampposts. Cool, huh? Montayne’s Rivulet, which this wood bridge crosses, is actually a natural spring that was redirected to form a watercourse by Olmsted and Vaux. It originally crossed 5th Avenue and emptied into the East River. Olmsted actually lived here in the late 1850s, in an old convent, while overseeing the park’s construction. Proceeding under Glen Span, the park path leads to a crosstimbered wooden bridge that crosses Montayne’s Rivulet where it descends into a waterfall over boulders. 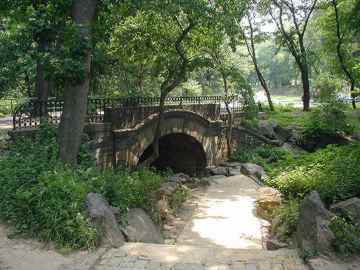 Buried deep in Central Park’s northern stretch, Springbanks is perhaps the park’s most secluded arch. 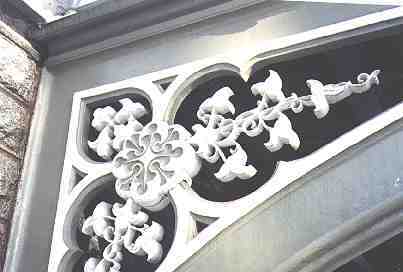 It is accessed by descending a flight of steps, like Trefoil Arch (see Part One). It is quite wet after a heavy rain as water cascades into it to join Montayne’s Rivulet, which is just ahead. Springbanks is said to resemble some of the archways in London’s Regent’s Park. To reach our next arch, continue through Springbanks as the park path takes you once again into the Loch. 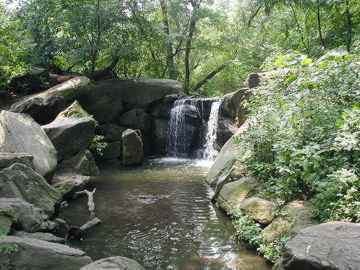 Enjoy the solitude and stillness as you enter Central Park’s most secluded region. We’ve one more wooden bridge to check out. 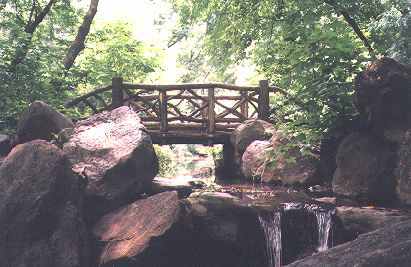 Just north of Springbanks Arch, this small wooden bridge crosses Montayne’s Rivulet…..
… and continuing along the park path along the rivulet, stop, smell the roses, or at least smell the ginkgo trees, and take in the waterfall view. It’s artificial, but who’s counting. The Ravine and Loch were reconstituted in 1993. Before that they had been choked with silt from the surrounding woods and taken over by non-native plants. Horticulturists subsequently planted red maples, sweet gum trees, tupelos and tulips along the Loch banks, as well as ostrich ferns and skunk cabbage. To many observers, Huddlestone is the most remarkable Arch in the park. 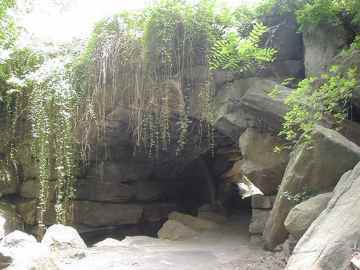 From some angles, it resembles a natural cave. It rests on neither mortar nor metal supports and is made of immense natural boulders, some of which weigh up to 20 tons, or 40,000 pounds. It has withstood traffic from horses and buggies on up to the SUV era. Huddlestone is marred only by the overshadowing Lasker Rink, built in the 1950s despite protests by park conservationists. From Huddlestone, we are almost ready to see our final Arch. 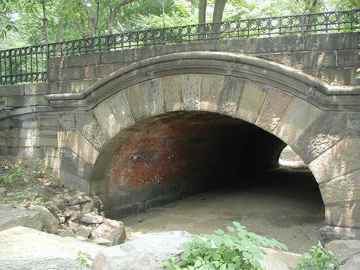 Bear left after going through the arch and follow East Drive as it skirts Harlem Meer, one of Central Park’s most famous reclamation projects. Once clogged and desolate, Harlem Meer has been remade into an urban oasis where kids catch sunfish and bass and cormorants alight on the Charles Dana Discovery Center. 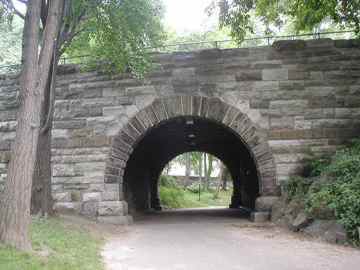 Location: takes park path under East Drive as it intersects Central Park West and 110th Street. Built:1890. Made of gneiss and ashlar. 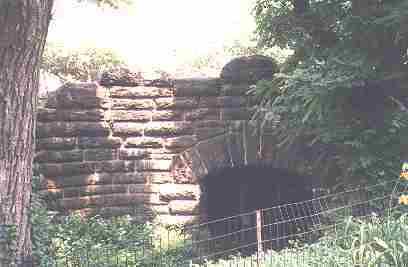 Like its sisters, Eaglevale and Claremont (see Part One), Mountcliff Arch was built to accommodate increasing population on the upper east side that wanted access to the park interior. This is the hilliest section of Central Park, and Mountcliff its the park’s highest arch, some 48 feet high. blog platform are you using for this website? I’m getting sick and tired of WordPress because I’ve had problems with hackers and I’m looking at options for another platform. I would be great if you could point me in the direction of a good platform.